The fan film that never happened!! A few years ago I got to know Dan Baran aka Fretslayer when he was looking for a Klingon set for a fan animation short he was working on, I offered to help and you can see the results on the blog here in the Klingon models, look for the Klingon Bird of Prey bridge. I found it was fun to work on internal designs and sets and that set my course for designing for a long while, none the less as Dan work on his animation we starting taking about doing a Star Trek animated story together, selecting the story was no problem as Dan already had worked on one and had a good basic outline to build on, I thought it was a good starting point and we both agreed to develop it. One of the problems I had early on was what period to set it in, Dan wanted to base it outside what was Star Trek normal canon universe making changes to the ship designs “basically kit-bashing the design”, I thought this was the wrong direction and mentioned it to Dan and I became a real pain in the neck about it, I thought it best to base it within Star Trek universe canon proper, it was the only area where we disagreed on at he beginning, for my point of view for working in the canon universe was that Star Trek fans watching would understand references we made without a lot of exposition, Dan’s idea was a great one and I won’t go into all aspects of his over all story idea at this time, as it was his and would not do it justice, but I will now go into what I suggested and wrote for the project, I structured a background story on too his concept and suggested the villein. First of all, I suggested the story take place in the years between the end of captain Kirk’s era and the start of captain Picard’s era, we quickly agreed and it is territory not really covered, then we went on to select a ship design, first of Dan wanted something that was a behind the lines design, not the ship of the line at all but a rear echelon ship well past its useful service basically a bucket of bolts that was nearing its end of use as was its captain, so we set the time around the Khitomer Massacre and the Enterprise C destruction and we could tack our story around that, giving us some room to develop the story and create a cast of characters and the all important enemy, more on the enemy later. OK the ship, not an Ambassador class, nor a Excelsior class, Oberth was to small and under powered I had just completed the USS ARIES around that time and while the ship would feature as captured starship commanded by Romulans, we both wanted to steer clear of the Enterprise Refit, that was a something we both agreed on. so what to use, what ship would give us the look and feel we wanted. 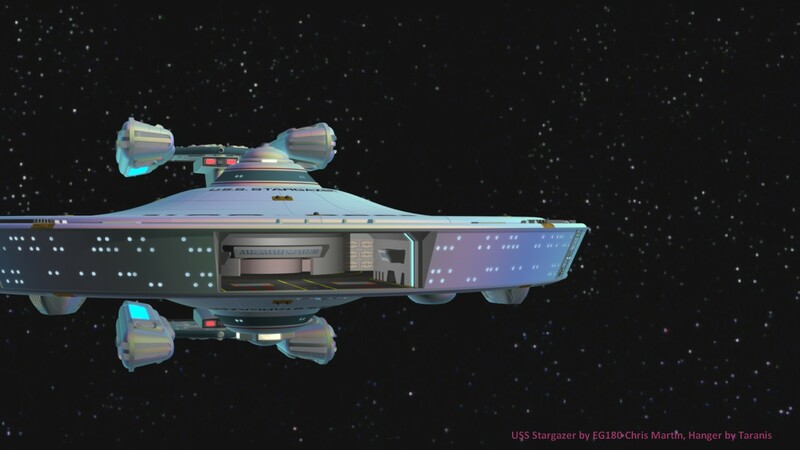 The Constitution Class or the USS Stargazer design commended by Captain Picard, Dan changed the name to USS Harkness and next we had to go and look for the model, I did not want to make on myself as I had enough on with the internal sets for the Romulan ship (more on that later). I know feel this way. 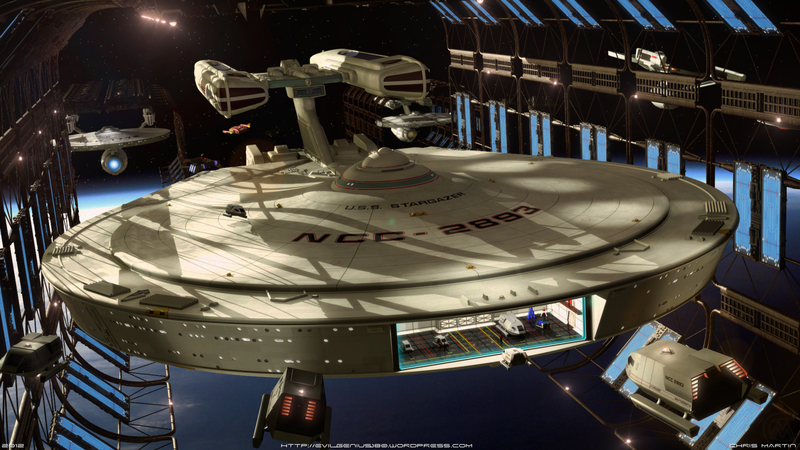 Chris Martin aka EG180 had just completed the USS Stargazer in TrueSpace and if you have not seen his work I highly recommend you check out his Blog and all the Star Trek designs he has produced over the last few years, here I will show his work on the Stargazer in all its well-lit glory and not the test shots I am going to show. Next up was the Romulan ship, we did not want to use the Warbird as seen in the Next Generation, the design reveal in STAR TREK TNG series episode where the Romulan reappear after decades of seclusion was a clear moment we though should remain in TNG era, the Warbird was of a class not seen before as I remember the episode, so we went back and remembered a fan design by atolm and modelled by Sean Kennedy aka treybor. 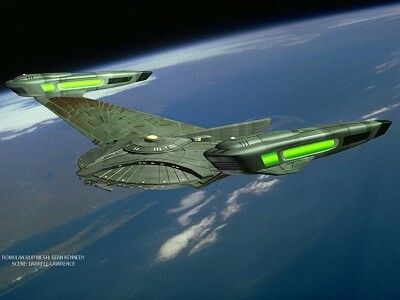 We both liked this design and thought it would suit our enemy commander, yes more on this individual later and it looked like the original series Romulan ship. So now I had to create some sets for this design, we both chatted over this for some time and the final look of the sets would be mine so if they look less than stellar is down to my views and modelling / designing approach to this. Keep in mind that these where in work in process status when I took these images, but again we wanted to keep the sets Spartan and just fill it with controls and so forth. 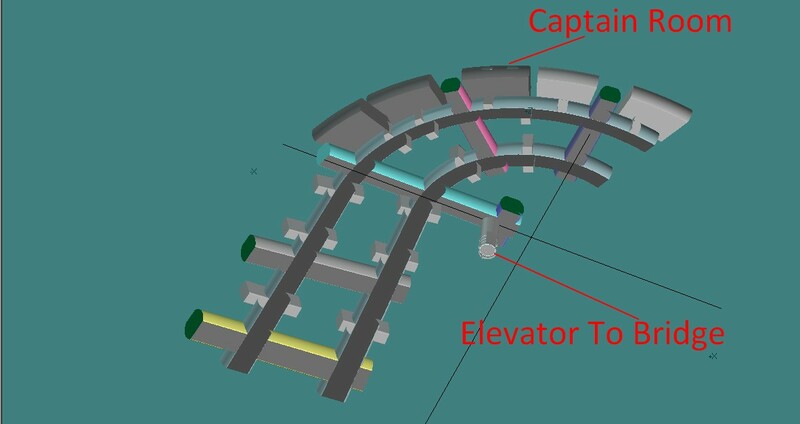 why the need to build all the corridors, we where planing a scene at the end where our Harkness Captain transports over to meet their enemy. Now for the enemy commander and why, Dan had no firm idea who the Romulan commander was going to be, it was going to be just some generic character that we would make up and build on. For me this was a wasted opportunity to go back into the history of Star Trek and make some good use of it, and again I suggested this course and I had a character in mind. Dan agreed to it and I was both delighted and thought we had a good Romulan commander for our Captain Vaughan to deal with, The Romulan Captain for the crew to deal with is the one that appeared in Star Trek TOS “The Enterprise Incident”, one of my favourite episodes. 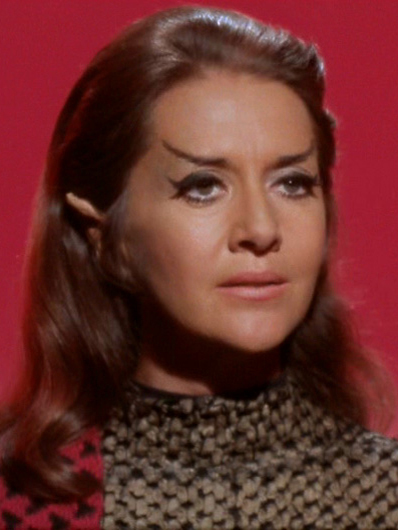 She was a great character played by Joanne Linville, Romulan Commander is given the name Dion Charvon in a 1977 Star Trek novel called The Price of the Phoenix, by Myrna Culbreath and Sondra Marshak. In the 1999 novel Vulcan’s Heart by Josepha Sherman, her name is given as Liviana Charvanek. 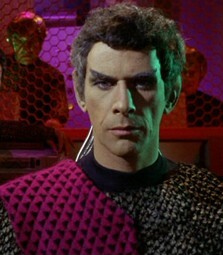 I did not care for the name in Vulcan’s Heart we both thought Dion Charvon was far more interesting. The Armageddon Clock story would also reintroduce Tal to the story but to mix it up a little I thought that over the intervening years since she ended up by her own actions ended up on the USS Enterprise essentially captured. In 2268 a female Romulan commander led a three ship squadron that captured the USS Enterprise after it illegally entered Romulan space. An ambitious officer, she felt that the achievement of her lifetime would be to bring the Enterprise back to Romulus intact. She saw that it would broaden the scope of her power greatly. She has a romantic interest in Spock, She invited him to dinner and went so far as to tell him that, unlike Vulcan women, Romulan women were passionate. She wanted Spock to serve at her side and take the Enterprise to Romulus. Spock reacted favourably to her advances. After she believed Kirk was killed by Spock, she expected Spock to agree to her wishes. In reality, Kirk and Spock were working under Federation orders to steal the cloaking device, Kirk was successful and transported back to the Enterprise with the cloaking device. The Romulan Commander Dion Charvon orders that Spock is to be executed but to buy the Enterprise time He asks for twenty minutes to exercise the Romulan Right of Statement. nearing the end of the 20 minute Spock asks for the Enterprise beams him back, in an act of desperation and surprise Charvon leaps to Spock and grabbing hold of him is herself beamed aboard the Enterprise. On the Enterprise bridge as more guest then prisoner Charvon orders her flagship to destroy the Enterprise while Kirk is negotiating for time, but this failed and the Enterprise makes a rapid escape by cloaking, and she is later turned over to Star Fleet along with her ship’s cloaking device. This officer is later identified as Commander Dion Charvon, while she was debriefed at Star-fleet command. After a few months Dion Charvon is returned to the Romulan Empire only to fined that her scope of her powers are reduced greatly. In fact she finds herself standing before the council and the Praetor and is striped of her position and property for the loss of the cloaking device to the Federation and her capture. Rather than asking for her execution the council asks that she is allowed to live and to live with the shame of her loss within the Romulan society. People that once called her friend now spurned her. Now homeless and destitute she saw no way forward only to take her own life in shame. It’s about this time that her former Sub-Commander Tal returned from his patrol, now a full commander after her capture discovers her faith and seeks her out and intervenes in her attempted suicide. Commander Tal now takes her into his house-hold and against all acceptable tradition and public option, he give´s her a position of authority. It is said he takes her into space on assignments with him, finding that her skills are unequalled in command and exploration matters. But her position was purely advisory, as no other Romulan officer acknowledge her as a commander. Commander Tal is in love with Dion Charvon and has always been so, beyond his stern looks he will always be lost to her. It cannot be said that she feels the same. Her heart was filled with vengeance against the Vulcan that spurned her, and Human that shamed her name. She never knew why she grabbed hold of Spock on her ship when he has been transported to the Enterprise. In her mind it was for the Cloaking Device, But in her heart was captured by this Vulcan. But her position was gone, and her chances of revenge was impossible. For long years they served together this way, Dion Charvon never again returned to Romulus and found that their association had not gone unnoticed!!. The élite Romulan intelligence agency the Tal Shiar, was interested in using them for some covert work. So they approached them with an offer to Charvon and an offer she would not refuse. Dion Charvon readily agreed only if she would resume command of a ship and after some hesitation she got a ship and with her goes Sub Commander Tal, who lose his position over his ship Charvon focused as she was on a deep plan of revenge against the federation. But deep down Tal knew she was always his commander and a better officer. For many years serving on the opposite side of the Romulan Empire Charvon slowly attains the rank of Admiral. During this period never she forgot the Enterprise or its deceptive captain and first officer Spock. She would later hear of Kirk’s death on-board the Enterprise-B, where she screamed in anger robbed of her revenge. Still there was Spock, now an ambassador for the Federation and the Federation itself. All she needed was the opportunity, the means to fulfill her personal revenge on the Federation and if possible somehow on Ambassador Spock. Around 2333: (when Jean-Luc Picard assumes command of the USS Stargazer) Admiral Charvon and her new squadron begins a period of exploration on a region of Space beyond the star know as Talvath when they make a discovery that could change her position and power. Here a plan of revenge formed in her mind, a revenge long thought beyond her, but now could implement due to her reinstatement to Romulan command, She never forgot the treatment at the hands of Captain Kirk (decease) and Commander Spock (now a Federation Ambassador) and the U.S.S Enterprise NCC-1701 (decommissioned) for so long she has hated the very names of these people and ship. The first planned attack is on Narendra 3, a Klingon outpost on a M-class world Narendra III is the third planet in the Narendra system. In the attack 4 Romulan Warbirds are used, this much is well documented. 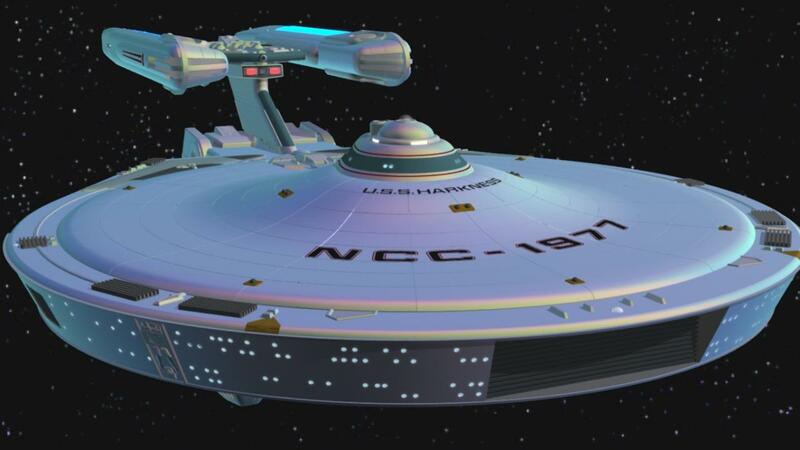 During the attack on Narendra 3 there is one vessel not expected to aid the Klingon’s was another federation ship and to Admiral Charvon dismay it was the U.S.S Enterprise NCC-1701-C, in her heart Charvon was delighted. This was a glorious moment for personal revenge, if not against the ship that caused her loss of honour but it illustrious name sake. In the ensuing battle with the Enterprise-C, an unforeseen element took place the Enterprise vanishes for a few moments the detonation of a photon torpedo created a temporal rift, It was our idea to use the alien device discovered by Charvon when activated weakens the area where the photon torpedo detonated an unforeseen result, before the Enterprise C reappeared before it was destroyed and not before Admiral Charvon orders some of the Enterprise-C crew to be taken captive. Lt Natasha Yar is one of the crew to be taken captive who is from an alternative time line where the Enterprise C was transported into the future time line where it will meet the Enterprise D.
The Romulan´s then retreating back too their boarders to see what the federation will do next Charvon moves forward with her next plan. The Romulan High council are completely unaware what is about to happen! This then leads into Dan story and I won’t go into that yet, but what I will say it would have dealt with the story of to ships, both commanders who for one reason or another felt lost and betrayed by the service they gave their lives too. It was also going to be a love story between Charvon and Tal, unrequited love, until the end for both characters, a bitter-sweet end. Dan liked the idea and the ending which he improved on later. It was going to be our version of The Wrath of Khan, we where hoping to even arrange the appearance of Ambassador Spock and Dan had poser / daz morphs that would have worked for the needs of animation..